Google announced the BigQuery ML service at Google Cloud NEXT 2018 in San Francisco. They have published wonderful help articles and guides written to go along with the product release that you should read here. Hint: It makes machine learning accessible to all (SQL practitioners)! Google touts their new product as having democratized machine learning by giving data analysts, and folks familiar with SQL, the ability to train and evaluate predictive models without the need for Python or R data processing. As an example of how impactful that goal is at Analytics Pros, our team is mostly comprised of Data Analysts with a much smaller subset of folks who have “Machine Learning Engineering” in their job title. Our ratio of data practitioners to data scientists is large enough to call this a “game changer” for our organization. Using BigQuery ML, you can easily create predictive models using supervised machine learning methods. The predictive modeling tools at our disposal are Linear Regression (predicting the value of something) and Binary Logistic Regression (predicting the type/class of something). We’re able to write a query that includes a “label” that will train our model using any number of data features. Data features are numerical or categorical columns that are available to make a prediction when a label is absent. The label in our training data is what makes this supervised machine learning (opposed to unsupervised learning in which we don’t have access to labeled data). 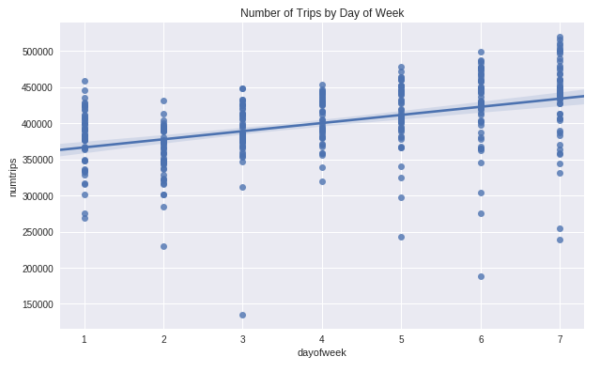 Our goal in this article is to predict the number of trips NYC taxi drivers will need to make in order to meet demand. This is a demand forecasting problem, not unlike problems you might encounter in your respective business vertical. Using a classic example written by the Googler, Valliappa Lakshmanan, we’ll convert his Python+TensorFlow machine learning demonstration into the new BigQuery ML syntax. Be sure to follow along using the Google Colaboratory published on Github. Our input data (features) will consist of weather data in the NYC area over the course of three years. Those data features will be trained to predict a target variable coming from the NYC Taxi dataset. The target variable is the number of taxi trips that occurred over the same three year period as our weather data. Our data features combined with the target variable give us everything we need in order to train a machine learning model to make predictions about the future based on observations from the past. The combined dataset of weather + taxi trips gives us labeled data, including features (weather data) and a target variable, ie. label (taxi trips). Using BigQuery ML, we will train a linear regression model with all of the heavy lifting done for us automatically, saving time without losing any predictive power. Some of the auto-magical work done for us includes splitting training and testing data, feature normalization and standardization, categorical feature encoding, and finally the very time consuming process of hyper-parameter tuning. Having this type of automation saves us a non-trivial amount of time, even for experienced ML engineers! BigQuery ML gives data analysts that are skilled with SQL, but less familiar with Python ML frameworks like TensorFlow or SK Learn, the ability to generate predictive models that can be used in production applications or to aid advanced data analysis. We encourage anyone wanting to use the BigQuery ML service to familiarize yourself with the underlying concepts of machine learning, but it is important to note that the days of having a PhD as a prerequisite for machine learning are coming to an end. This service is helping to bridge the skills divide and help to democratize machine learning data processing. First we collect the number of taxi trips by day in NYC. We do this by querying the BigQuery public data for New York City. This SQL will give us the data we need to label our prediction model. Within the trips WITH-clause, we use EXTRACT to generate a date key using the date parts YEAR and DAYOFYEAR. Our example uses the years 2014 through 2016 because the schema is consistent for those periods. 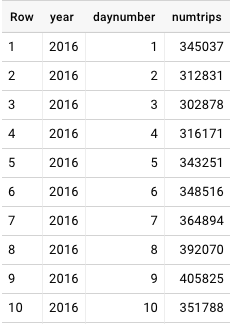 The query will COUNT() the numtrips per each year and daynumber in the data. In Fig. 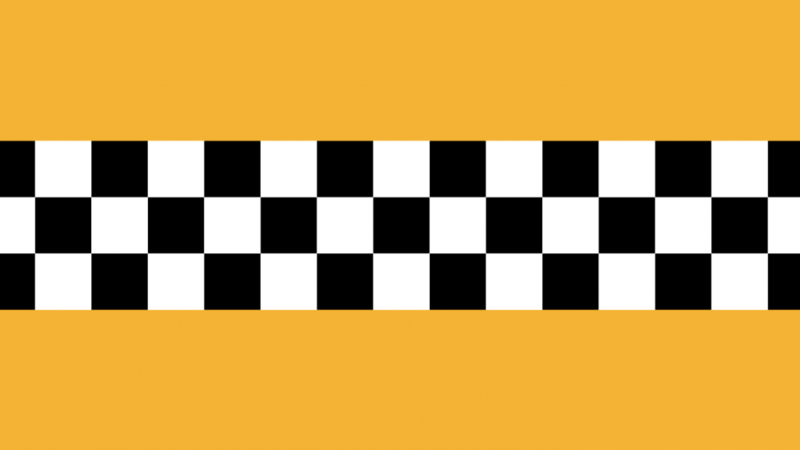 1 we see the number of NYC taxi trips on January 1st, 2016 was 345,037. That was a Friday, and a predictably cold week in New York City. If you look at the data, you’ll see the weekly pattern reveal itself. With peak demand on Fridays and Saturdays with a sharp decline on Sunday and Monday. Learning how to export your BigQuery data directly to Data Studio to explore your data deserves a blog article entirely (stay tuned!) In the meantime I will walk through some of the exploratory analysis steps performed in the Python Colaboratory Notebook supporting this article. 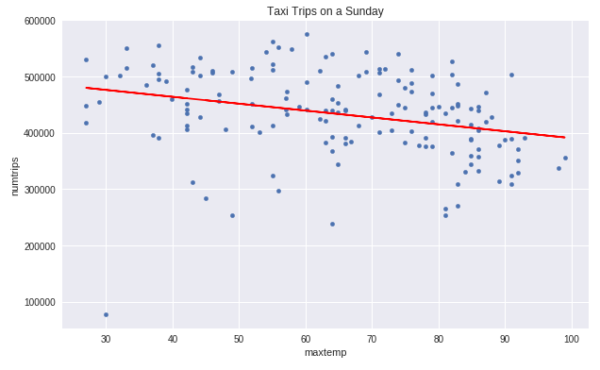 We have a hunch that there is correlation between the number of taxi trips in New York City and the weather. We feel so strongly about this that we’re willing to build a machine learning model to mechanize this insight. Before we do this, we want to look at the data and get a feel for whether or not it will be useful in building a linear regression model. Fig. 2 – Looking at all the data we see a slight correlation between trips and temperature. The line isn’t flat, so we’re saying there is a chance! The expectation was that temperature would have some influence on the prediction model. 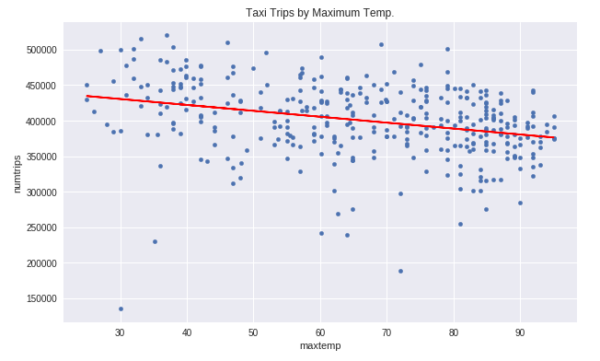 In this case, we see as the temperature increases the number of taxi trips decrease. More importantly, the inverse is true: as the temperature decreases the demand for taxi’s go up. That is our first insight. However, the insight isn’t as valuable as we’d expect. The loss rate on the above line is very high. We want to see if we can find a way to minimize the loss. Fig. 3 – We see a pattern in the weekly seasonal data; Saturday a peak with Monday a low. Now the fun part! We’re going to create a linear regression model using the new BigQuery ML SQL syntax. This new syntax gives us an API that can build and configure a model and then evaluate that model and even make predictions using new data. This model is available on the globally distributed Big Data Machine that is BigQuery. I’m envisioning very interesting applications built on this service, but most importantly I’m seeing a huge breakthrough for data analysts who are skilled in SQL but less so with Python or R. This is a wonderfully democratizing step toward putting machine learning data processing into a much broader reach. You’ll see magic numbers like 99.99 and 725030 in the above SQL. The stn value is the station id for LaGuardia and 99.99 was found in EDA to be invalid input. Now that we have labeled data it is time to train a machine learning model. BQML has a simple, and familiar, syntax to do this. It is that simple. You’d replace [QUERY] with the SQL query we used to generate our label data. After only a few short moments we have a regression model generated having been trained and evaluated using three years of taxi and weather data. We are already familiar with an effective linear model. It’s called the “average”. We could very easily spend time building a machine learning model that could be beat by simply predicting the average of the data. In order to prove that our machine learning model is better than the classic linear model (average) then we’re going to need a score metric. Enter the MAE, or otherwise referred to as the Mean-Absolute-Error. The MAE is a way to calculate the aggregate loss rate, and doing so in a way that penalizes big misses. When you think of aggregating the loss rate, then you’re summing all of the loss distances shown in Fig. 5 above. Our Mean Absolute Error is 43,800. The good news is we were able to beat the baseline error rate of 50,419 found in the previous step. By beating the MAE of the entire dataset, we’re able to say that our model has more predictive power than a standard linear average. This is mostly because our model will factor in the day of the week, which we found to be an important signal in the data. In the accompanying Colaboratory Notebook we inspect the weights of the different input features in more detail. 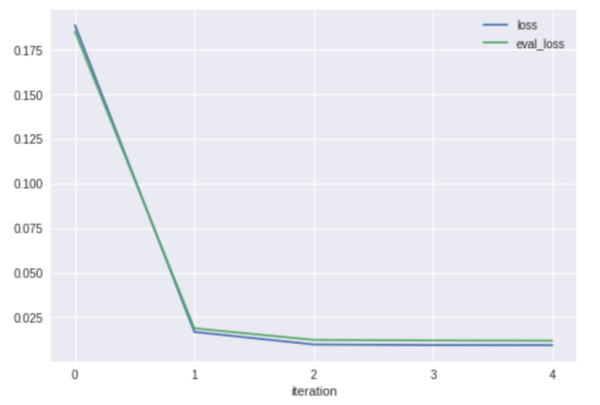 Note regarding ML.EVALUATE(): BigQuery ML prints out different score metrics when using a linear or logistic regression model, including Precision, Recall, and F1 Score. 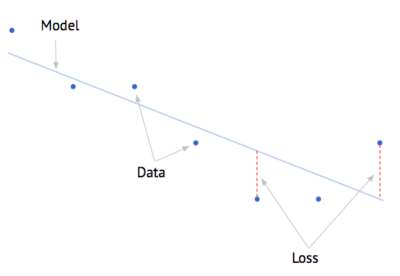 We see that our model only took a few iterations in order to achieve a low loss rate. In fact, 90% of the loss was diminished between the first and second run. In this case our model didn’t have to work very hard to reach a convergence. BigQuery ML, by default, will attempt 20 different training + evaluation iterations before stopping. You can set this number to be higher in the OPTIONS when creating your model using the max_iterations flag. Additionally, by default, the training will stop once it sees no progress is being made; this can be overridden using the boolean, early_stop flag. 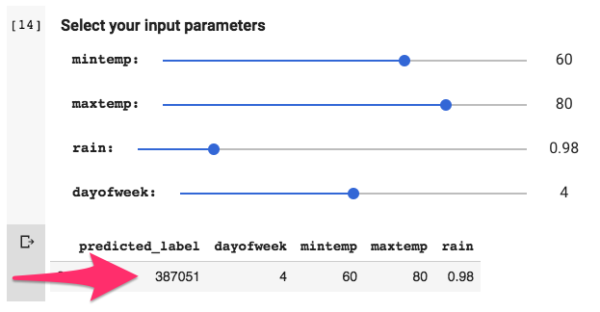 Finally, you’ll notice that the learning_rate was fluctuating between training runs, this is an example of hyper parameter tuning that is automatically being performed by BigQuery ML. This is a special, time-saving gift to the data science practitioner, like manna from heaven. We’re now ready to make predictions against our model! To do this, we need to feed it new data. The ML.PREDICT() function will return a prediction for every row of input in the query. The ML.PREDICT() function accepts a MODEL to evaluate against and the input comes from the TABLE or QUERY. Your query needs to be wrapped with a () if that is the route you chose. In the example below we use a QUERY that includes only a single row of input. In other cases you would want to feed in multiple values at once or point the entire input function to a TABLE. Be sure to checkout out the entire Data Analysis and Machine Learning course on Coursera to learn about these concepts in detail!